Nick.com has a whole bunch of these build your own game creators based on various properties they have like Spongebob and iCarly. The game creator we will be focusing on for this post is their ‘The Last Airbender’ game creator. 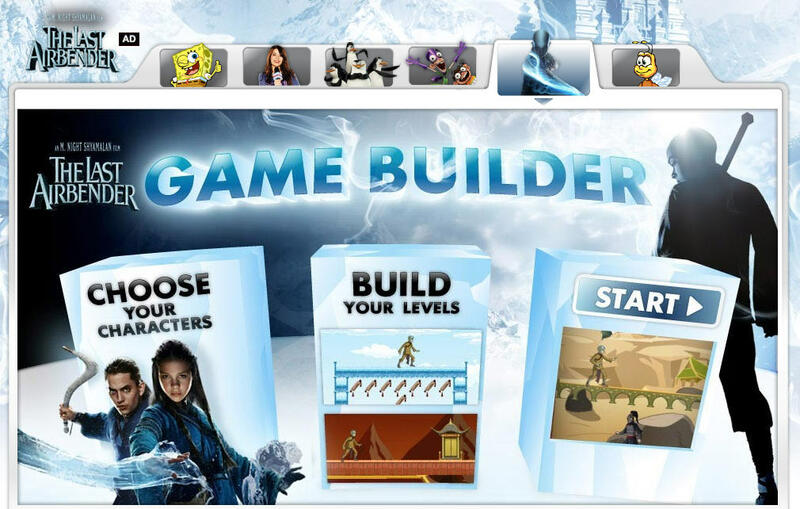 The game builder is built in Flash and it publishes out to a Flash client as well which means you could built and play these games on your Android devices (a tablet would probably be better than a phone because of the bigger screen size). The game builder doesn’t allow you to customize any of your own graphics for the game but it does lead you through six steps to building and publishing your game. You can only provide about 5% of the actually game with 95% of the game being provided for you. 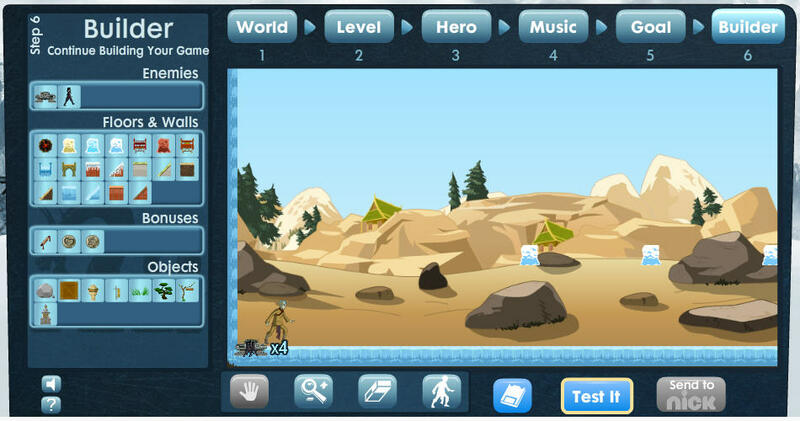 The six steps to create a game with this game creator are World, Level, Hero, Music, Goal, and Builder. In the World tab you can choose from various environments from the movie including a snowy land and three other various mountain lands. Whatever one you choose becomes the background of your game. It also handles it’s own parallax which means there are three layers in there but that is all handled internally inside the game engine so you don’t have to setup all three of the layers yourself. With the Pulado create your own game engine you can control all three layers for a parallax. The next section is the level section where you choose from 5 different maps that are pre-built. Once you choose a level you can then choose one of four heroes from the Hero section. On the next tab after that you choose one of four music tracks for your level. And of coarse the fifth tab is the Goal tab where you can choose what you would like the goal of the level to be. Your choices are Reach the Door, Collect them All, and Defeat All Enemies. They are pretty self explanatory. Reach the Door lets you drop a door on your map and the player has to get to the door to win. Collect them All requires that the player collect all of the items that you designate for them to collect. When you choose this option it creates a bunch of random items on the map for you. And finally Defeat all Enemies means you must destroy all of the enemies on the map to beat the level. When you choose this option it creates a bunch of random enemies on the map for you to defeat. Finally there is the Builder tab where you can complete customizing your game. You can add on to the existing level by adding new walls, floors, decorations, and enemies if you want to. You can also choose where you want the player character to start the game. You can zoom in and out to make it easier to edit the map as well. You can test your map here as well to see how the level plays and if it still needs tweaking you can come back and tweak the map some more before publishing it. Once you have your map exactly how you like it you can publish it and other people will be able to play it. 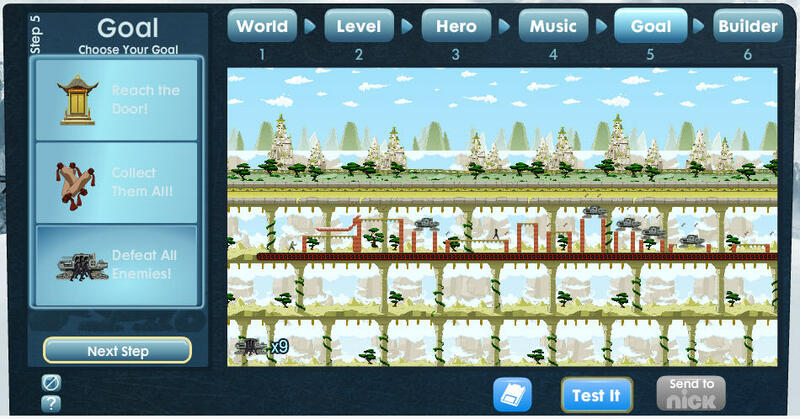 Head on over and start build your own flash game based on ‘The Last Airbender’ here.